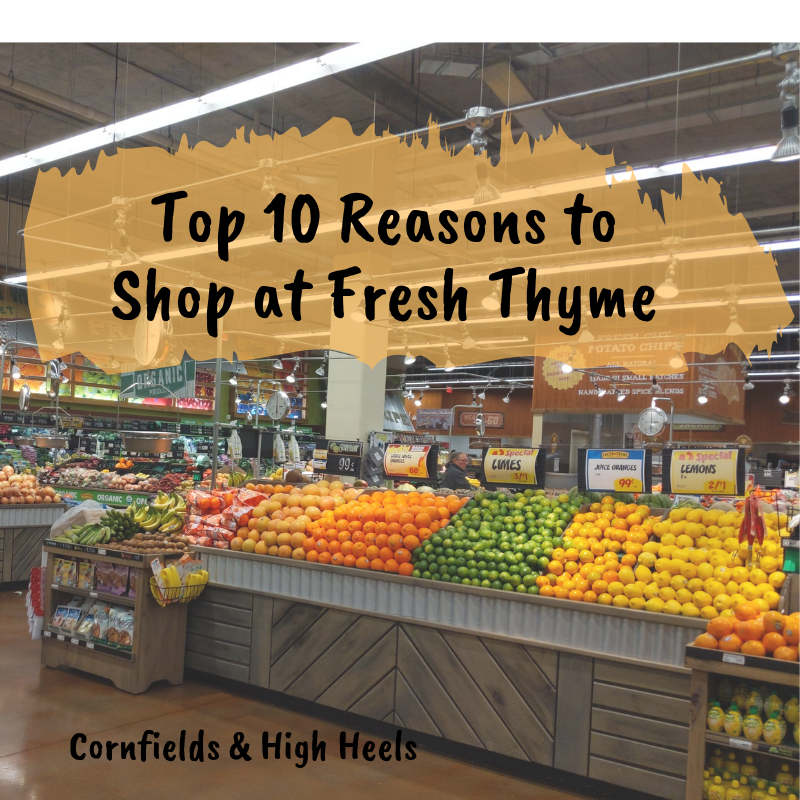 I recently had the opportunity to visit one of my local Fresh Thyme locations for a tour of the store with theCityMoms group of Indianapolis. I was already somewhat familiar with Fresh Thyme as a customer, buying produce here and there, but I was pleasantly surprised to find out some really great things about this company! So much that I’m making a blog post on it, no affiliate strings attached. Special thanks to the Broad Ripple location at 6301 College Avenue in Indianapolis and theCityMoms for this tour! Oh my word, their produce section is amazing! Aisles and aisles or fresh, local produce. The colors, varieties, and prices are better than I’ve found at any other grocery store. When I first heard that Fresh Thyme was a “health store” I immediately associated it with high prices, but I quickly learned that this is not the case here! They have weekly specials on produce and even the produce that is not on special is affordable. They have a wide selection or regular and organic produce. Think $0.49 advocates, $0.99 cauliflower or $1.99/lb for Honeycrisp apples! They have a large variety of meats and seafood in the display case and in the meat aisle. I often get my skinless chicken breast here on sale for much cheaper than other stores. If you keep an eye on their ads, they have weekly deals! Both wild and farm fish are available in the seafood case. Wondering what this means? Wild means that the fish have been caught in their natural environments and farm fish were raised on a fish farm. Fresh Thyme aims for wild fish but due to seasons will occasionally have farm fish available. Select locations have coffee and smoothies cafes in them, including the location I visited! Some locations may only have the smoothies available but if you are near a location with either I highly suggest you check them out! For under $4 you can get a smoothie made with fresh fruits and vegetables. Over five smoothie flavors to choose from and a ton of supplements that can be added to them! And who doesn’t love shopping with a coffee in hand? They offer everything from espresso drinks to teas and regular coffee. Not a coffee fan? May I then suggest a Chai Latte for $2.79!? Again, this is based on select locations like the Broad Ripple location but what a great concept and idea! You can create your own pizza or sandwich in their deli section. Pizzas and sandwiches are under $7 and have a variety of topping and meat options available. Cafe seating is available and, in the warmer months, they have patio seating available! Great place to stop for a quick lunch! Oh, they also have sushi (only special for $5 on Thursdays)! Fresh Thyme makes their juices fresh and in-store daily for customers. This includes their orange juice and most popular right now, celery juice. I sampled the orange juice and it has the unsweetened but purely sweet taste of freshly squeezed oranges. Juices are 100% fruit and vegetable with no sugar added. My mind was blown when I discovered that they have nut butter machines that make your own peanut butter straight from the dried peanuts. I’ve passed by these machines at my local store many times and never realized what they were! You can choose from regular (unsweetened) peanut butter, honey roasted peanut butter, almond butter, or cashew butter. The nuts are added to the machine, turn the knob, hold your container under the machine and the butter will come out, as much as you desire. You just pay by the pound! I know where I’ll be getting all my almond better from! The Chipsters. In the middle of the store, they have a chip making machine on display (behind glass, of course) that makes a variety of delicious and crispy kettle chips. Including sweet potato chips! They make chips fresh, in small batches, all natural with no artificial colors, preservatives or msgs. You can grab a larger bag at the Chipster stand for $2.99. An aisle just for coffee sits in the bulk food section and seems heavenly. I’d like to grab one a bag of their fresh bread and go sit in the middle of this aisle to work, smell coffee, and munch on bread. I won’t…but that doesn’t stop a girl from dreaming! Fresh Thyme has its own roastery and offers over a dozen different blends as well as K-cups and other local roaster’s beans. With over 3,000 products available in-store, you can find all-natural and chemical-free products ranging from shampoos to essential oils and vitamins at affordable prices. I’ve compared their products to Amazon and I’ve found Fresh Thyme to be similar or sometimes more affordable. Upon entering the store you’ll notice that Fresh Thyme is kid-friendly in several ways. Kid-sized carts are available for shopping along with mom or dad and kid’s activities can be found throughout the store. Kids can play “spot the red tractor,” while shopping if they find where the red tractor that has been hidden in the store, they can tell the cashier and receive a reward. A free piece of fruit is available for each child, found in the “Kids Thyme” bin in the produce section along with coloring pages and crayons.